With Spinal Curvature Correction, experience a dramatic decrease in pain in discomfort, but more importantly a sense of restored health and energy. A key principle of our team at the Chiropractic Health Club in Riverside is to lead our patients to a more healthy overall experience of daily life. This typically begins with treatments to address specific problems in the body, bringing you to a point of little to no pain. This focus however, while very effective, is aimed towards immediate relief. What if you are looking for more comprehensive, long-lasting results? Dr. Kang specializes in a technique known as Spinal Curvature Correction — a highly-advanced, scientific, and proven chiropractic technique which corrects and restores your spine back to alignment. Through a combination of biology, physiology, physics, geometry, and anatomy, Dr. Kang will identify the causes of your altered health — the pain, discomfort, and loss of mobility affecting your body. Your diagnosis, and subsequent treatment plan, is based on sound scientific and chiropractic principles. 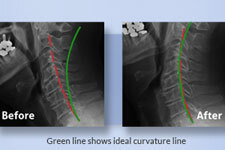 How Can Spinal Curvature Correction Help You? Dr. Kang starts with a scientifically-based examination of your posture, spinal alignment, and function – often involving x-rays as a way to pinpoint the root cause of your spinal misalignment. Once the source is identified, he will create a carefully planned series of adjustments, exercises, and a spinal remodeling program to put you on a pain-free road to better health. You have likely heard what happens when a person “breaks their back” or “breaks their neck” — they damage the spinal cord and, if the damage is severe enough, become paralyzed. Your central nervous system, which stems from the spinal cord at the center of your spine to all the nerves throughout your body, is the most important organ system. It is the system that handles communication from your brain to every part of your body — all the vital message controlling every organ and the other body systems. It is also EXTREMELY delicate. Imagine the vast network of freeways and roads. Just one accident or obstruction can quickly cause a traffic jam and delay, or even prevent, cars from passing. This is exactly what happens to your central nervous system when it is damaged or stressed, your nervous system can’t send or receive that information properly. Proper spinal alignment, and therefor correct posture, ensure that the spinal cord is in an optimal position to perform effectively. The bones that make up the curves in your spine protect and reduce forces acting on the spinal cord and nerve tissues. We are naturally born with good curvature but, gravity, age, poor posture, improper physical activity, injury, and disease can all play a role in the misalignment of your spinal curves and, as a result, your entire body. Spinal Curvature Correction can help restore that balance. Neck, Back or Body Aches? Need Relief? If you are in a lot of pain, schedule online with the form above or call (951) 341-6565 and ask for a same day appointment. We have appointments as late as 6:00pm.